Home » Is This A Mid-Channel Pause? 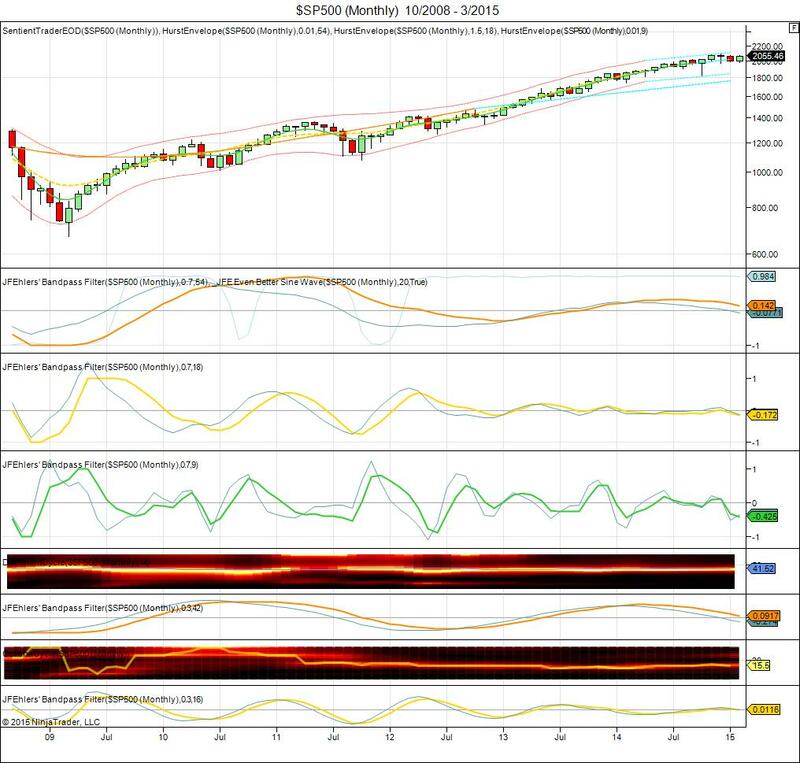 This entry was posted in Analysis Trading US Markets on February 7, 2015 by David Hickson. As any trough is approached in the markets I always like to stand by in anticipation of that trough, in case it happens early. Troughs occur early in bull markets, and we have been in a bull market for some time, so expecting an early trough has been a useful thing to do for the last few years. When the US markets pushed up strongly this week I asked whether Monday 2 February was an early occurrence of the 20-week cycle trough that I have been expecting to form later in February. At first glance it seems very unlikely. With 110 days since the October 2014 trough it is quite possible, but the shorter cycles don’t break down very well. 48 days since the 80-day cycle trough in mid December 2014 seems unreasonably short for an 80-day cycle. And 17 days since the probable 40-day cycle trough in mid January 2015 makes it much more likely that the trough on 2 February 2015 was of only 20-day magnitude, and that the 20-week cycle trough still lies ahead of us. But then why was the move up this week so strong? 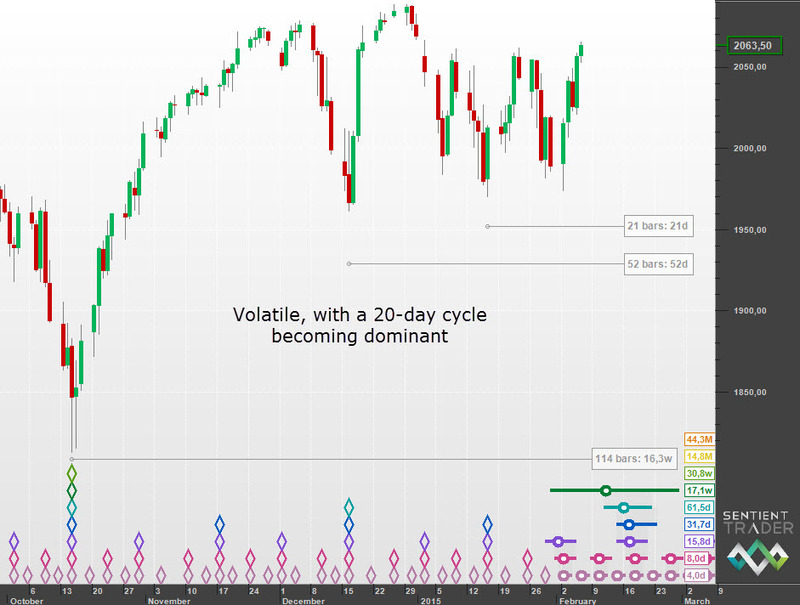 Often the simplest answer is the correct one, and the simple answer here is that the market is seeing an increased volatility at the 20-day level as that cycle rises to dominance, and so although it seems like too big a move for the rise out of a 20-day cycle trough, it might not be in the context of increased volatility. This would explain the strong move and implies that the market will still move down (probably with equal strength) into the 20-week cycle trough as we have been expecting. 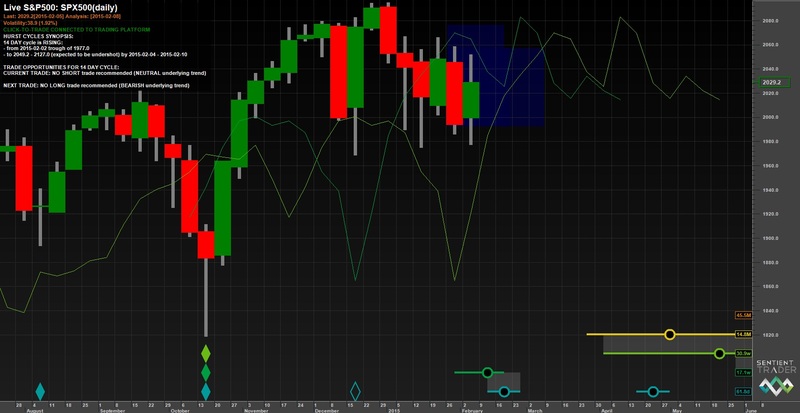 (This is supported in my opinion by the fact that the European markets did not see as strong a move up this week – but with all the inevitable fundamental interaction that has resulted from the Greek elections and their aftermath, that is a fairly spurious point to make). But we still haven’t answered the question of whether it is possible that the 20-week cycle trough has occurred early. I like to play Devil’s Advocate with any analysis, and there is an intriguing possibility here which suggests that the 20-week cycle trough has occurred, even if it is (almost) impossibly early. And that has to do with the Mid-Channel Pause. Hurst defined something called the Mid-Channel Pause, which is the “pause” in price movement on the way up to the peak of the cycle, and a matching pause on the way down to the final trough of the cycle. The Mid-Channel Pause (MCP) occurs at roughly the time of the trough of the cycle two degrees shorter than the cycle that formed the initial trough – the trough that forms the start of the developing M-shape. The MCP features strongly in the FLD trading strategy, which offers an easy way of describing the MCP. The MCP occurs at the B-category interaction on the way up, and the G-category interaction on the way down. I usually describe these interactions as being times that price “tracks” along the FLD. It is unusual for price to cross the FLD strongly, and that is because it is in the process of “pausing” on its way up, or down. The B-category interaction occurs around the time of the 20-day cycle trough, following a trough of 80-day magnitude, which of course matches exactly the definition of the MCP. The 20-day cycle is two degrees shorter than the 80-day cycle (one could say “two cycles down in the nominal model”). The MCP is very useful because it warns us not expect much of a move down into the trough at the time of the MCP (the 20-day cycle trough in the example of the FLD trading strategy) and it also provides a useful way of projecting an upside target for the full move up to the first peak of the M-shaped cycle. This information is applied in the FLD trading strategy by the general guideline of not going short at the B-category interaction, and in the calculation of the target for the C-category trade (which is known to be a reliable and profitable trade to make). Why am I going on about the MCP? Because when a trough occurs particularly early, and without much downside movement, producing an unbalanced and not very satisfactory cycle shape, I always ask myself whether an MCP is forming. The MCP suggests that the October 2014 trough was of 18-month magnitude (which is possible, although I continue to favor the 40-week option discussed here). 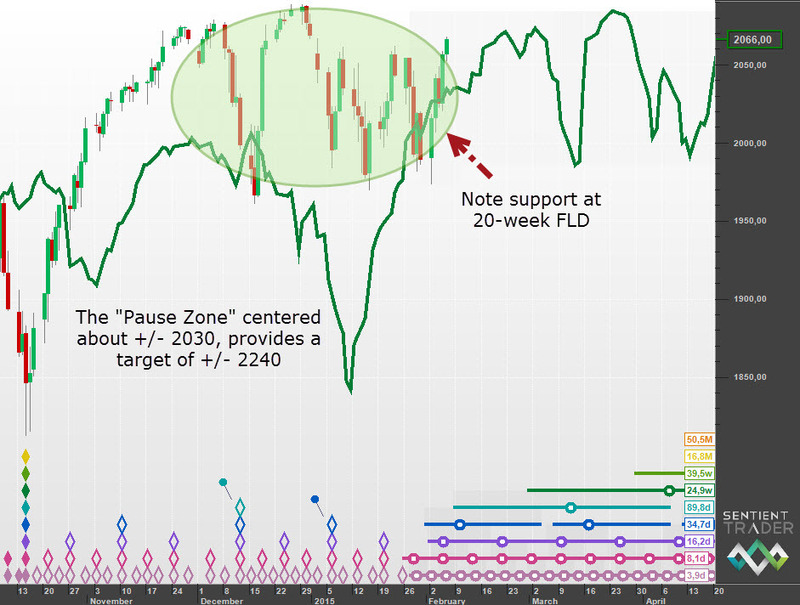 The “Pause Zone” is fairly clear, and is centered around the 2030 area in price. Note also how price found approximate support at the level of the 20-week FLD, which is exactly what we would expect of a B-category interaction between price and that FLD. In order for the first option to remain valid (that the 20-week cycle trough has not yet occurred), price will need to come down fairly strongly within the next two weeks. There might still be a good short trade to be made there, and then the bounce out of the 20-week cycle trough will offer a good long entry. If the second option is the correct one (that the 20-week cycle trough has occurred and price is breaking out of an MCP) then price will not come down hard at all, but will probably form a typical B-cat interaction with the 20-day FLD. Then we will have a good long entry opportunity. If the first option turns out to be true, then it is likely that the 9-year peak has formed, and so there is a limited upside. If on the other hand the second option is correct then the 9-year peak probably still lies ahead of us, and there is more time for us to enjoy the profits from long trades. but with the 40W trough in october it looks like a – downgoing (G interaction) – mid channel pause, I think. What makes me ponder though, is that the dip in the 40W FLD is quite early relative to the expected 20W trough, which to me indicates it may have passed already. I would consider the dominance of the 20D in line with the neutral underlying trend. My question is that the low on 02/02 was not as deep as the low on 01/16 so wouldn’t that signal that he 02/02 low is not the 20 week low because it failed to move lower. Also looking at the 40 week FLD there is another relationship of price falling to it before each subsequent move higher. Not that the pattern has to continue but that FLD is now dipping into the area of the 20 week ow and is suggestive that it is the dominant cycle. In that same vein, I also noticed that quite regularly (but not always) that whatever the first cycle after an 18 month cycle occurs has the greatest correction than usually 2 cycles above that will follow with a similar correction and magnitude. I was wondering if you think they have any significance or relevance to your knowledge of Hurst principles? Of course this is based on the 18 month low being in October of 2014. Another interesting observation is the difficulty of the 54 month troughs to synchronize with actual price lows if you start your analysis prior to 2002 low because it looks more like a six year harmonic cycle is in place and that would suggest that a significant low should be occurring within a months time. One last observation is that regardless of whether I pin the 54 month to 03/2009 or let Sentient trader make it own analysis with a start date of 09/04/1998 it marks October 2014 as an 18 month trough but does not mark 03/2009 as a 54 month. If I pin the 54 to 0/2009 it becomes a 9 year trough but October 2014 is still an 18 month trough therefore I respectfully disagree with the idea that October was a 40 week low but I know I could be wrong about that. I know this was a mindful. Thoughts? David, an argument against this being a mid-channel pause with a projection over 2200 would be that coming out of the October trough the price objectives based on the 20W, 80D and 40D were all undershot. The 20W and 80D were significantly undershot. No matter the magnitude of this trough this shouldn’t have happened unless longer cycles are strong down. I don’t know about anyone else but meaningful analysis seems to be hard to come by right now. Maybe it has something to do with the market manipulation David wrote about. I’m not convinced that this is mid-channel pause but I’ve considered it recently. One thing I am looking at is that IF this market is to turn bearish, a more serious decline has to start fairly soon. That is because most important tops require price to head down before the 40 wk FLD peaks out (I have that peak occurring in April). A meaningful bear market would require price to head below the 40 wk and 18 month FLDs and that move would have begin at any time. Again that is only if Dec. saw a significant top. Nominally the late Jan low could have been a 20 week low. And it could just as easily be ahead us. What I don’t like is the FLD configuration and the missed targets off the Oct. low. But I’ve come to realize that just about anything can happen in these markets. 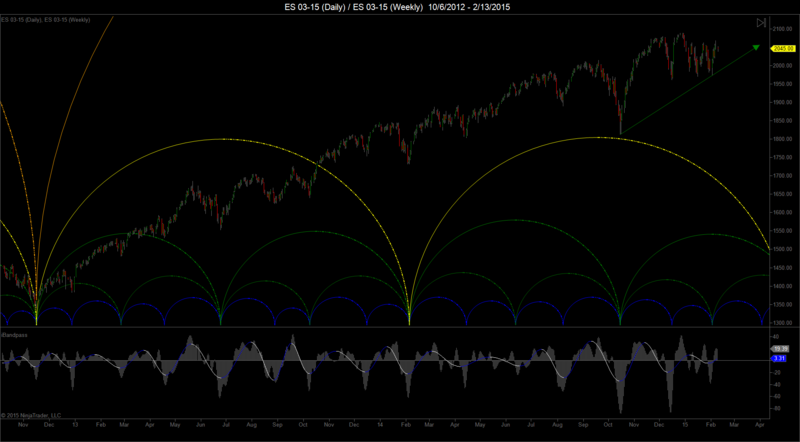 Your analysis that paints a 20 week low on February 2 is in accordance with my filter analysis of the 10 week wave. The most recent low is still a bit tentative though. Below is a daily chart of the ES dating back to the November 2012 low showing the filter output of what I believe to be the 10 week wave. I then used a drawing tool to create synchronized, simple harmonic troughs of all the longer waves (even though filter output does not work that way). Even though the current 10 week wave is somewhat shorter than the most recent average, it is not the shortest oscillation in the sequence. A 20 week synchronized trough phases to February 2. What is wreaking havoc with the analysis is the recent enormous amplitude of the 20 day wave and some of the shorter waves. Hurst stated that this phenomena causes modulation of the longer waves, particularly at tops. The 10 week wave based on my filter analysis has put in 14 consecutive higher highs since the last 4 year low, an incredible uptrend! A break in that sequence will indicate a very high probability that the uptrend is over. Due to the large amplitude of the short waves, cherry-picking the top becomes a little easier (though not recommended for the faint of heart) if one is so inclined. As for this being a MCP, it would be very difficult to draw a dominancy envelope or “channel” around anything shorter than the 10 or 20 week waves due to the large variation in amplitude. A “pause’ at the midband of the longer waves may sometimes indicate that the dominant wave has run out of gas and won’t make to the top of the channel which signals a potential change of trend with respect to that wave. The picture will be much clearer in a couple of weeks. I think youre right David. I didnt take the D cat short last week due to underlying trend being up or flat depending on calc. Im trading other exotic markets right now. I think the euro currencies are straddled 80 week troughs and crude is as well. Good post, thank you. Gold looks due for a good long if the 20 week VTL holds. It seems FLD projections have been tricky in these markets and the modulation is relentless, as mentioned by other posters. Liquidity is low. The day traders push extremes often, and banks are making decisions quicklier than years past. However trades do exist everyweek. Cocoa had a good short on the 40 day VTL. NZDCAD had longs last month. Euro had a great meltdown gime trade after the bearish 40 day cycle. I posted a coffee trade, a live cattle trade and a cocoa trade the last few months. Trades are there IMO. I wager that tis is the 20 week cycle low and MCP as it is the clearest solution and the news hasnt hurt the market yet. News will be the determinant IMO. Thanks all.